Use a paper towel to lightly grease a skillet or 9x9 baking dish with vegetable oil. 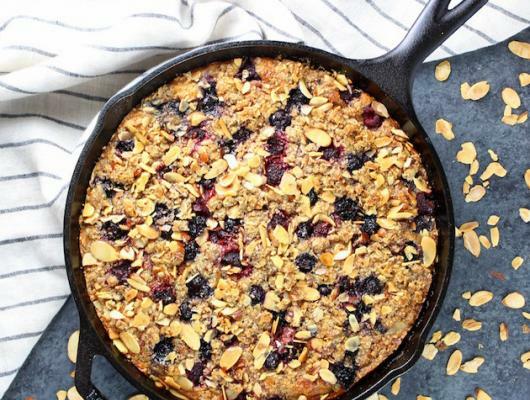 Place all cake ingredients except the fruit in a blender or a food processor fitted with the steel blade (oats, eggs, almond milk, Greek yogurt, maple syrup, baking powder, baking soda, almond extract, and salt). Blend or process on high, stopping to scrape down and stir the ingredients as needed, until the batter is smooth and the oats have broken down almost completely. Set aside. In a separate bowl, mix together all the ingredients for the crumble except the butter and the berries. Then add the butter and work it into the dry ingredients with your hands, squeezing until it turns into crumbles. Stir in the fruit and set aside. Pour a little more than half of the batter into the skillet. Sprinkle on the berries, then pour on the rest of the batter. Top evenly with the crumble. Bake for 45-50 minutes or until a toothpick comes out smooth. 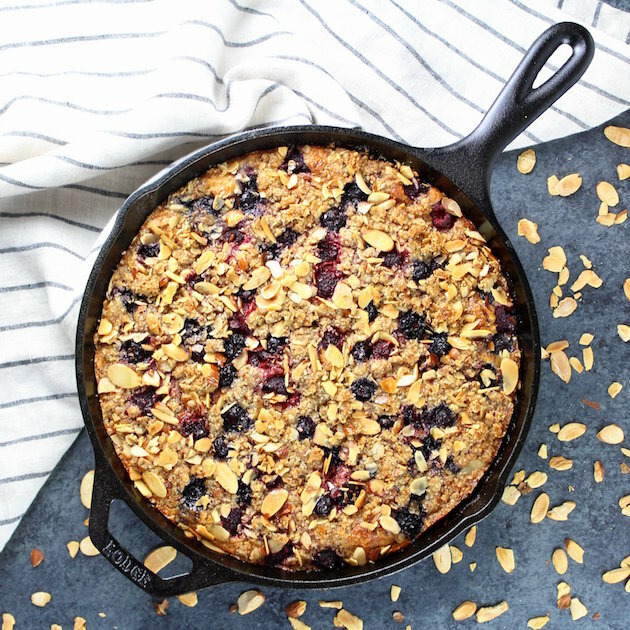 Triple Berry Blender Cake: gluten-free, super moist, fruit filled, very tasty skillet cake that's ridiculously easy to make!